In the short time between sunrise and sunset the low light present the landscape in a fine way with good details on the clouded day. Norway has a very elongated shape, one of the longest and most rugged coastlines in the world, and some 50,000 islands off the extremely indented coastline. 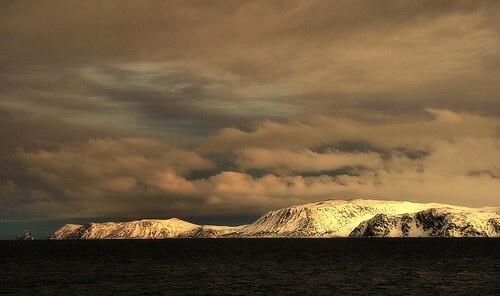 The mainland covers 13° latitude, from 58°N to more than 71°N, (Svalbard north to 81°N), and covers the longitude from 5°E in Solund to 31°E in Vardø (Jan Mayen to 9°W, Kvitøya to 33°E). Norway is one of the world's most northerly countries, and one of Europe's most mountainous countries with large areas dominated by the Scandinavian Mountains; average elevation is 460 m and 32% of the mainland is located above the tree line. Virtually the entire country was covered with a thick ice sheet during the last ice age, as well as in many earlier ice ages. The movement of the ice carved out deep valleys, and when the ice melted, the sea filled many of these valleys, creating Norway's famous fjords.